Milton Friedman (July 31, 1912 – November 16, 2006) was an American economist, statistician, and writer who taught at the University of Chicago for more than three decades. He was a recipient of the 1976 Nobel Prize in Economic Sciences, and is known for his research on consumption analysis, monetary history and theory, and the complexity of stabilization policy. As a leader of the Chicago school of economics, he profoundly influenced the research agenda of the economics profession. 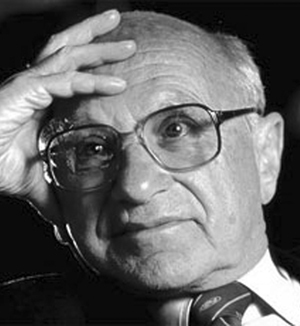 A survey of economists ranked Friedman as the second most popular economist of the twentieth century after John Maynard Keynes, and The Economist described him as "the most influential economist of the second half of the 20th century ... possibly of all of it." History suggests that capitalism is a necessary condition for political freedom. Clearly, it is not a sufficient condition. It's a moral problem that the government is making into criminals people, who may be doing something you and I don't approve of, but who are doing something that hurts nobody else. Only a crisis- actual or perceived- produces real change. When that crisis occurs, the actions that are taken depend on the ideas that are lying around. The existence of a free market does not of course eliminate the need for government. On the contrary, government is essential both as a forum for determining the 'rule of the game' and as an umpire to interpret and enforce the rules decided on. The problem in this world is to avoid concentration of power- we must have a dispersion of power.